Date: Saturday, 5th April 1986. 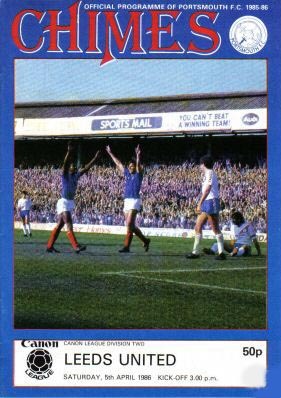 Score: Portsmouth 2 Leeds United 3. Scorers: Portsmouth: Blake (2). 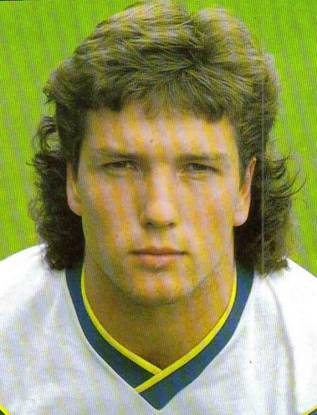 Leeds United: Ritchie (2), Baird. 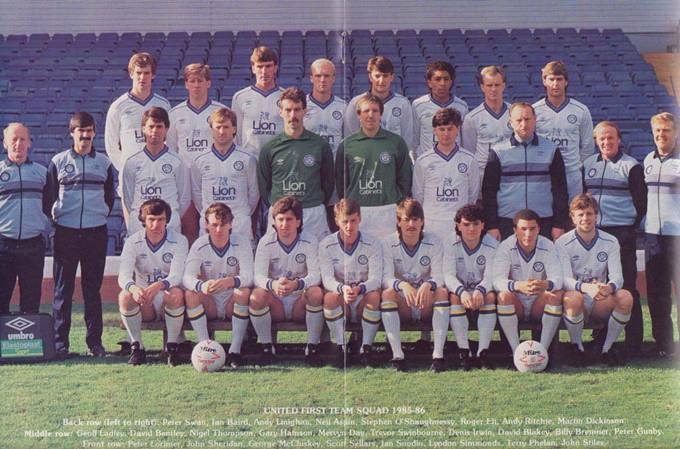 Leeds United: Day; Aspin, Robinson; Snodin, Ormsby, Rennie; McCluskey, Sheridan, Baird, Swan, Ritchie. Unused sub: Stiles. 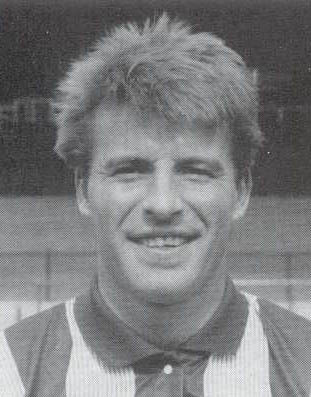 Andy Ritchie struck twice for United to dent Portsmouth's promotion bid in April 1986. He also dented his hopes of a move to Portsmouth by turning on the style against the club who desperately wanted to sign him. 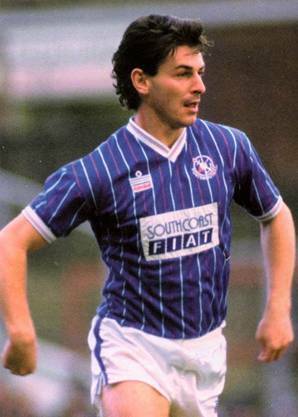 The United favourite struck twice to ruin Pompey's chances of promotion and, despite being impressive, the goal feast almost certainly ended his hopes of playing First Division football with the Fratton Park outfit the following season. 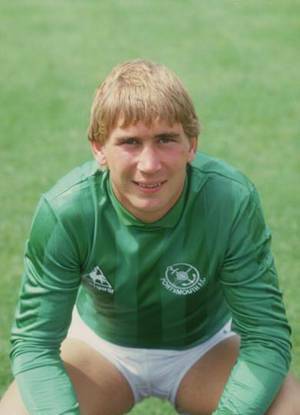 Former Manchester United star Ritchie had seen a £70,000 switch to Pompey fall through in the summer of 1985, but with the south coast outfit sitting pretty in the division he remained a target for their summer strengthening programme. Those plans were shattered, though, as United belied their lowly Second Division status to complete a rare double over Portsmouth with Ritchie proving chief destroyer. In a season full of low points, United saved their best for Portsmouth. Unknown teenage debutant Lyndon Simmons netted twice when United beat the south coast side 2-1 at Elland Road in November and his team-mates followed that in April by over-turning the form book once again. Noel Blake put Pompey 1-0 up after eleven minutes and the writing was on the wall for United. 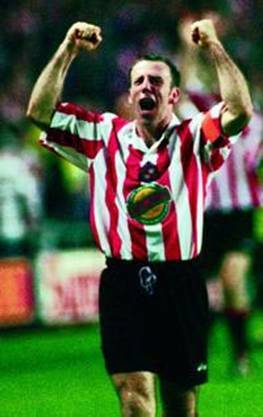 However, Ian Snodin and John Sheridan led a revival that saw United steal a memorable victory. Andy Ritchie levelled with a superb lob before Ian Baird turned the game around with his first goal in ten games. Ritchie rubbed further salt into the wound when he added a third, following great work by Ronnie Robinson, and United were in dreamland. 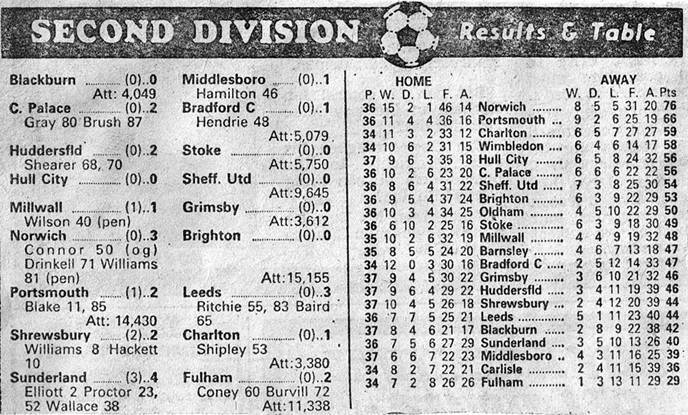 Blake, who was later to join Leeds, did pull another goal back but Billy Bremner's side hung on to record their first away win since a 3-0 success at Wimbledon the previous December. 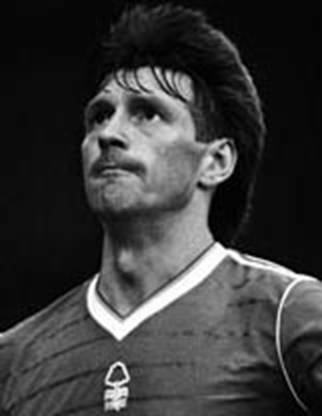 Ritchie, whose original move to Pompey collapsed because of a slight knee injury, showed little remorse afterwards but admitted the move still interested him. "If Portsmouth win promotion and come in for me again then the offer of First Division football has got to interest me," said Ritchie. "I told Portsmouth when I had my medical that my injury was not serious, but they wanted someone to go into their side straight away. My display proved a point in relation to my fitness." Ritchie was on a week to week contract with Leeds and he added: "The ball is in Portsmouth's court." 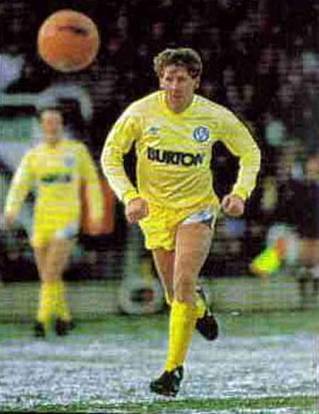 That week to week contract at Leeds was to continue for another twelve months before Ritchie finally left for Oldham in the summer of 1987. At the same time, Portsmouth were finally celebrating their return to the First Division, although they were relegated that same year and took fifteen years to bounce back. A quick summary: Andy Ritchie clenched his fist and thumped his right knee, “Nothing wrong with that,” he said. Pompey discovered that when the Leeds striker rattled in two goals to send their promotion drive into a temporary tail-spin. 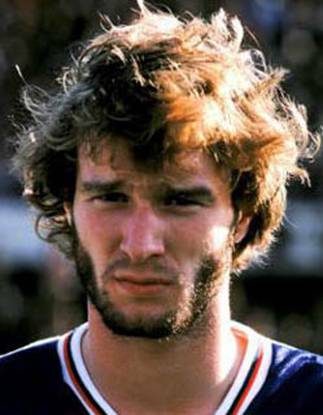 Just a few weeks earlier Ritchie had been rejected by Portsmouth because od doubts about the knee. Ritchie said, “The deal was arranged then Pompey’s medical experts said there could be a problem and I was sent home. 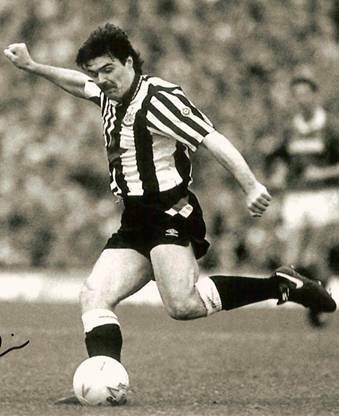 But as soon as I arrived back in Leeds I was told to train on it.” Ritchie’s first goal was a stunner flying over Alan Knight’s outstretched arms from a difficult angle, but he put the record straight. “I tried to cross it and was as surprised as anyone when it went in. Ian Baird got Leeds’ other goal and Noel Blake scored twice for Pompey. Mick Kennedy, the Pompey skipper, faces another ban after being booked for the ninth time in the season. A second version: What a difference a month can make in football. 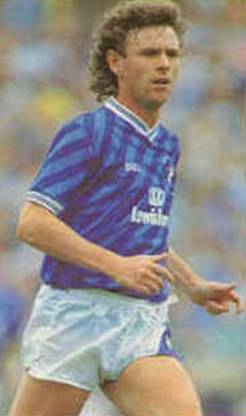 A month before, Andy Ritchie had left Fratton Park disconsolate after a £70,000 move to promotion-chasing Portsmouth had been wrecked by a minor knee injury. 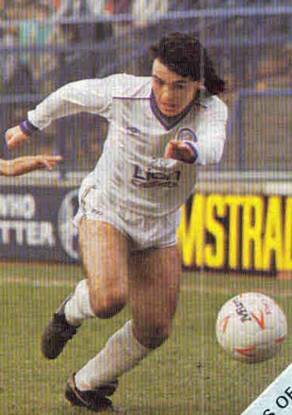 In this game he was still a member of a Leeds team too near the Third Division for comfort. But this time when he left, his face was wreathed in smiles after scoring four goals in the last three games. Not surprisingly, for Ritchie had poached the two sharp goals to prove his point to Alan Ball and seriously dent the home club’s hopes of returning to the First Division. Portsmouth were still favourites to go up but this defeat and performance must question their ability to stay there if they get there. Leeds exposed the slenderness of resources. The match turned in midfield where Portsmouth had no-one to match the driving runs of Ian Snodin and the delicate distribution of John Sheridan. An equal part in Leeds’ success went to the defensive web spun by the three centre backs. 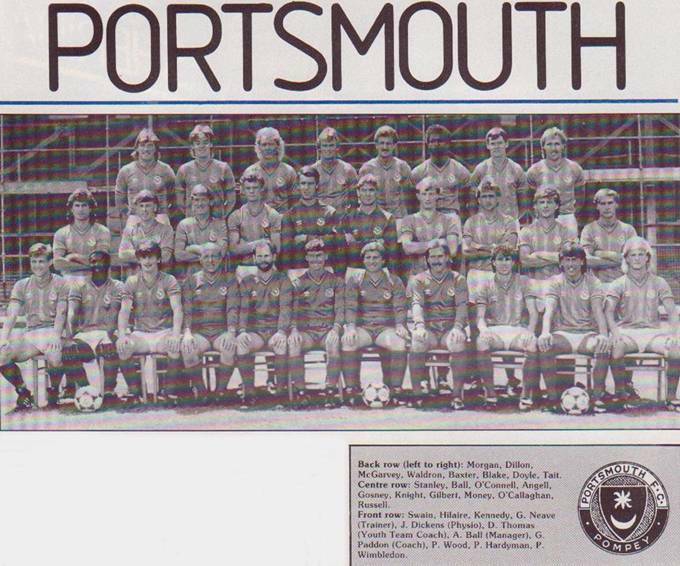 They held Mickey Quinn and Mike Channon so tightly that one glancing header by Channon was the sum of Portsmouth’s threat to Mervyn Day apart from Noel Blake’s two goals. 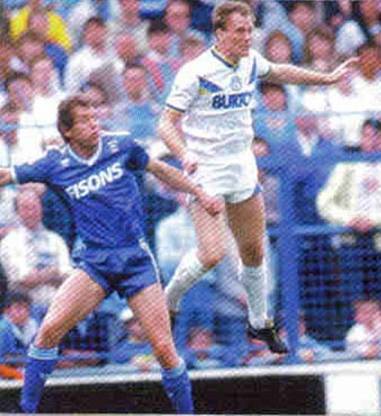 Leeds’ defensive discipline faltered only once in the eleventh minute when Blake was totally unmarked as he nodded Portsmouth ahead from Kevin O’Callaghan’s free-kick. 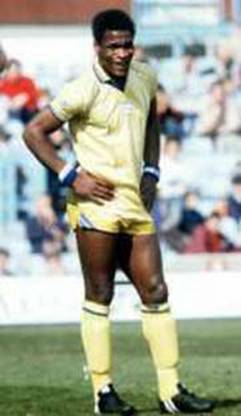 Leeds’ frustration showed as Ian Snodin was booked for a reckless challenge on Vince Hilaire. As he was on seventeen points, it was likely to lead to a suspension. Ian Snodin and John Sheridan got their act together and long before half-time the signs were ominous for the home side. 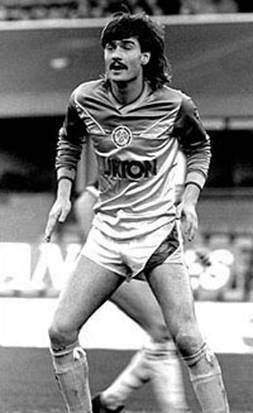 Eventually ten minutes into the second half Leeds were level as Ritchie, who was still in dispute with the club and on a week-to-week contract, caught goalkeeper Alan Knight off his line with a delicately flighted cross shot. The second Leeds goal underlined the confidence which was beginning to flow. Ian Snodin began it with a run from deep in his own half, signaled David Rennie to feed it back to him and when he did so, Snodin was away to set up a simple tap-in for Ian Baird. Portsmouth began to throw men forward and become increasingly vulnerable on the break. Seven minutes from time they were exposed again as Andy Ritchie’s shot took a slight deflection to leave Alan Knight helpless. Within three minutes, Noel Blake had forced home his second goal, but it was too late to deny Leeds the double they deserved.